Did you know that, with a BizCap loan, your small business can finance up to 90% of the capital investment needed to make your business grow? This means your company can retain “cash in pocket” to fund operations. Why tie up your small business’ cash in long-term capital assets when you can put it to better use? 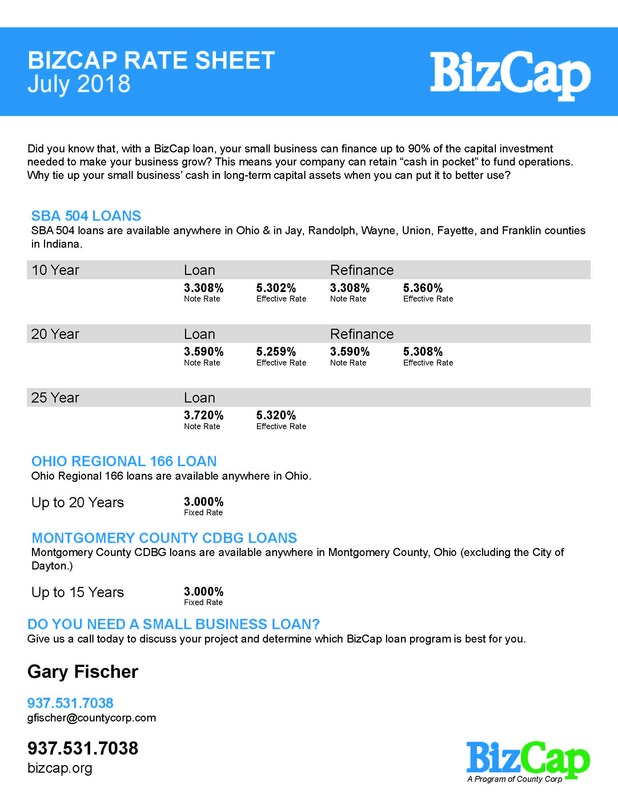 SBA 504 loans are available anywhere in Ohio & in Jay, Randolph, Wayne, Union, Fayette, and Franklin counties in Indiana. 504 Refinance Loans are available to businesses looking to refinance eligible fixed assets and business expenses. BizCap can issue SBA 504 loans in rural counties in SBA region 5 which includes Illinois, Indiana, Michigan, Minnesota, Ohio, and Wisconsin. To simplify maters, the program applies in any county that has been classified as “mostly rural” or “completely rural” by the US Census Bureau. Don’t know if your business is located in a rural county? Call us and we’ll let you know. Ohio Regional 166 loans are available anywhere in Ohio and have terms of up to 20 years. Montgomery County CDBG loans are available anywhere in Montgomery County, Ohio (excluding the City of Dayton) and have terms of up to 15 years. Need a copy of our rate sheet to include in a proposal, take to a meeting, or just to forward on to someone else? Click on the link found below to download or print the current BizCap rate sheet.